The parsha begins with the visit of Moses’ father-in-law Jethro (whose name forms the title of the parsha) to him in the wilderness, bringing his wife Zipporah and their sons Gershom and Eliezer with him. Jethro notices that Moses is struggling to sit as Judge over the whole of Israel himself, and advises him to appoint deputies to sit in judgement over ‘thousands, hundreds, fifties and tens’ of the people. The people of Israel come to the Desert of Sinai and God stops them there and tells them to prepare for the giving of the Covenant and the Law, and the Ten Commandments (or rather, ‘Ten Words’ or ‘Ten Sayings’) are given, outlining the basis of the whole Torah. The passages in Isaiah are, in chapter 6: Isaiah’s vision of the heavenly Temple, which the Tabernacle in the Wilderness is intended to symbolise and reflect. Torah portions are usually named after the first word or group of some of the first words which occur in that section, and Parsha Yitro is no different. “Now, Jethro…” However, in having a portion named after him, it is a clue that the person of Jethro is a significant character, and from a Christian/ Messianic perspective, he may be viewed as a ‘type’ (symbol or foreshadowing) of Christ. In what way? In fact, this links perfectly with the ‘Great Commission‘ where Jesus appoints his disciples to act on his behalf to carry out His mission – not to ‘judge’ (although Paul later makes reference to a time when Jesus’ disciples would judge on Christ’s behalf) but rather to bring in the Kingdom, where Christ – the Wonderful Counsellor, Mighty God, Everlasting Father, Prince of Peace – is King, and where healing can be found. following the tradition of finishing the portion on a positive note, but also drawing attention to the idea that the Kingdom brings blessing. The fact that the Haftarah selection refers to the reign of the Messianic king also links the Covenant to the Kingdom. The New Testament selection links the Centurion to Jethro as a model for Kingdom advancement (discipleship) in that he recognised that he is a man under authority, with soldiers under him; as I learned in The Salvation Army, we are “saved to save”, which was the message in different words at Elim last week. THIS is the nature of the Kingdom, the nature of our God. Selah! I don’t normally make a big deal of Easter – I normally try to keep passover and if it coincides with Easter, well and good, but if it doesn’t, it’s just another weekend. This year though we have relatives visiting over the long weekend, with all the attending issues of a family holiday. It has also become much more like Christmas since the weather changed and we’re all stuck indoors. I would have liked to do things ‘my way’ in a much more Jewish context but with family visiting, I’ve been inundated with all the Eastery things I dislike about the Christian festival – chocolate eggs and bunnies and the temptation to gluttony and selfishness and bad tempers. The issue of mental health, or rather illness has reared its head as well, and I can’t help feeling, in the context of Christ’s work on the cross supposedly including healing our diseases, just very frustrated and a little bit angry (with God? With the Church?). Why is there not more healing? Why are some faithful believers never healed? Then there has been the inevitable holiday telly. We’ve been watching “Dances with Wolves” this afternoon. One of the themes of the film is Identity, with American / Anglo culture clearly portrayed as lacking soul and integrity in comparison with the Lakota Sioux Indian culture. Whilst there is undoubtedly some historical revisionism going on for the film, it does seem to be an ongoing theme of shame or guilt over historical English misdeeds, all related to the idea that somewhere along the way we lost that soul and lost who we were meant to be. It’s an old film, but it still raises the questions (for me anyway) What does my name mean? Who are we? What is English culture? Is there anything of value that’s worth saving, redeeming, re-discovering, protecting? Is it a hybrid culture anyway, a mixture of Celtic, Roman, Anglo-Saxon, Viking and Norman, is it natural to carry on absorbing other cultures into our own? But there is a deep longing, I think, to find deeper roots, so people are looking all over to find a solid path – in Buddhism or Paganism, atheism, politics, or even dare I say Judaism or Celtic Christianity. I do believe that underneath it all is God the Rock, who is Jesus and He is solid and reliable. But in terms of health and mental health, the Rock seems so slippery, so covered in moss or seaweed or something that stops us quite getting hold of Him. How do we scrape away all the things that prevent us from holding on to the solid place? I blogged for a few years with a captive audience of friends at Multiply under the name “Life for Beginners” and when the Multiply platform folded, I found myself in an isolated location without internet and despite valiant efforts, lost all my posts, so I have had a writing hiatus of about three years. I’m starting again, mainly because I want to document all the crazy changes that have happened and which are continuing to happen now in 2014, and specifically to record my reading. I have had several other blogs in various places, which I may link to later, but I haven’t been faithful or consistent, so I won’t make any promises about being faithful or consistent 🙂 I have a lot going on, but I’ll do what I can. I have decided to take part in the Read52 challenge, to read 52 books in 2014, which is conveniently one per week. I am a reader, and I tend to read in certain distinct categories of non-fiction much more than fiction. These categories are, broadly, health, education, sociology and religious. For reasons that I will explain in due course, religious is probably increasingly my largest category, so I will aim to read the Bible at least once this year, but don’t plan to do it in a week, so not sure whether I will include it in the 52. This week doesn’t count as it’s only a partial week, but I thought I would start anyway with a little book that’s easy to read. I picked one that is little more than a pamphlet at 36 tiny pages, which has been on my shelf for a long time, challenging me to read it. 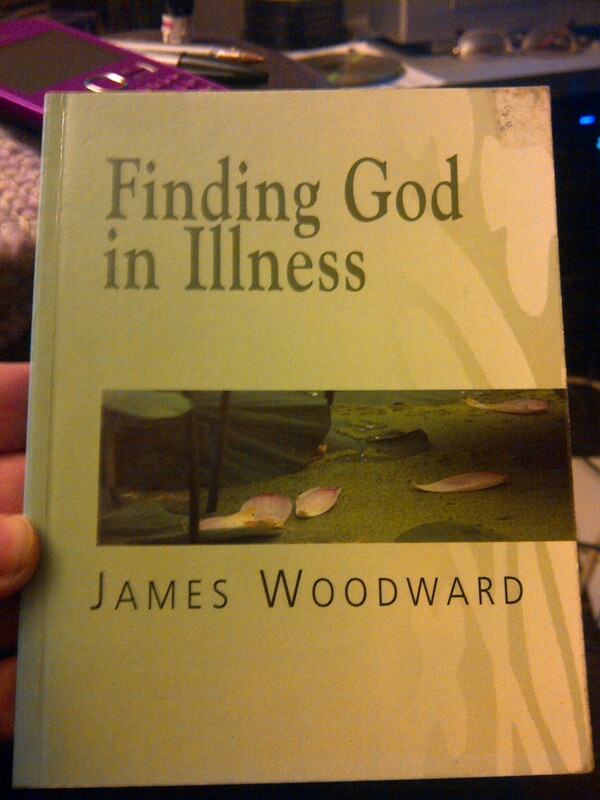 It’s called “Finding God in Illness” by James Woodward and published by Lion Publishing in the UK with the Christian Evidence Society in 1997. It is out of print, but available on line as a pdf file here, and is quite easy to find second-hand if you prefer your books in paper. So who are you, and why are you here? I’d love to hear from you, and perhaps you could provide me with the accountability I need to post consistently. I haven’t been consistent in reading blogs either, so I’m starting with no links, but I hope to build them up as I rediscover my favourite internet places. I’m Carol….aka Orthodoxmom3…and I’m here because I discovered you are following my blog! 🙂 Thank you. I found your post very well written and it looks like the blog will be very interesting! Wondering how you found me… Wow…. 5 likes on your post today so far….looks like you are off to an Amazing start! I see! Well, If you don’t mind me asking…why the separate blog? I know there are lots of people that do this. I’m just curious what made you decide to separate them? I write about a LOT of various topics on my own blog… but I feel that in some ways they blend together…sometimes not so much. I wonder if I’d get more followers separating them…but afraid to lose some if I did. I’m really new to how all this works…so I’m just wondering what makes others decide to do theirs separately? Hi – I’m Robin and welcome to the 52 Books challenge. I’m always looking for accountability – in my reading, writing, etc. I like the quote because it makes one think. Thanks Robin! I have discovered that I actually work better to deadlines, so I’m sure that Read52 will be a positive thing for me in 2014. Hi, thanks for following my blog and keep up the good work!